The Tubbataha (too-bah-tah-hah') Reef in the remote center of the Sulu Sea is one of the world's finest dive locations. 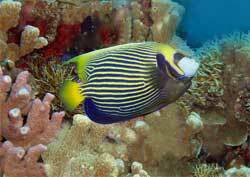 It has a rich and dense marine life – with several hundred species of both coral and fishes. Tubbataha Reef is noted among divers for its abundance of vivid corals, expansive sea ferns, colorful crustaceans, magnificent turtles, chromatic small fishes, and striking large fishes. The last includes sharks, whale sharks, mantas, tuna, and barracudas. And the soaring, perpendicular underwater walls are legendary. Tubbataha Reef is normally accessible only three months a year, from about mid-March to mid-June. Sea conditions are too rough for the remaining 9-month span. For the best underwater visibility and the calmest seas, go in April or May. You can reach Tubbataha Reef only by boat. It lies 180 kilometers (110 miles) southeast of Puerto Princesa, the capital of Palawan. The voyage lasts about 10 hours each way.